Stephen Gilbert Sr is said to have had a seventh child, a daughter, about whom little is known. It is possible that it is Sarah Homan. There is no evidence that her maiden name was Gilbert. This research is to learn more about Levi Homan (1789-1865) and his wife Sarah (1782-1867). Thanks to Mark Davenport and Elizabeth Moult for sharing their research and getting me interested in this puzzle. There is another candidate, Ruth Gilbert, who married Joseph Walker. See the web page on this couple. It is possible that both Sarah and Ruth are daughters of Stephen Gilbert. 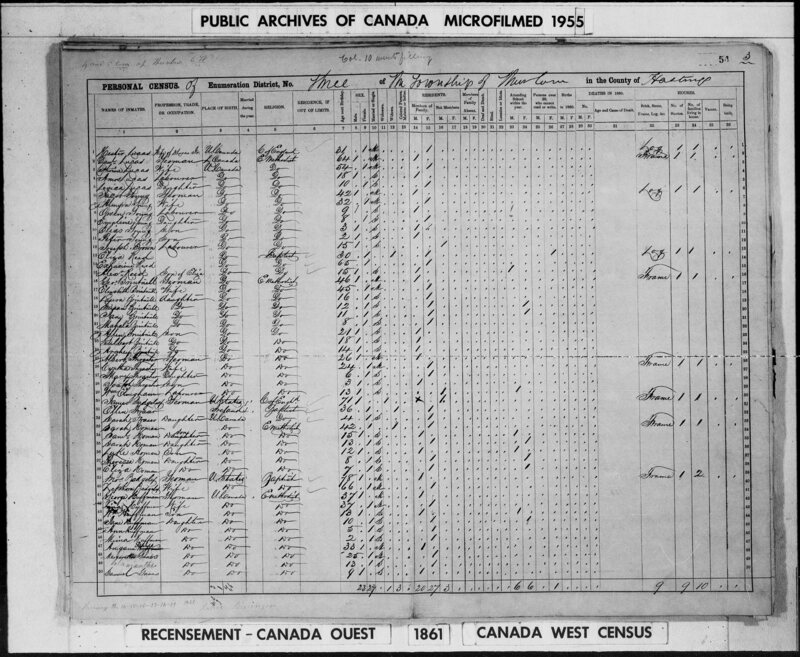 Based on the 1861 census, Levi and Sarah Homan were both born in Upper Canada in 1789 and 1782 respectively. This means their parents would also be in Upper Canada. However Sarah's birth year of 1782 is too early for a birth in the Quinte area. There is a John Homan who is said to have received a free grant of lot 4, con 5, Thurlow in 1801. He may be Levi's father. The key document linking Sarah to the Gilbert family is the 1817 surveyor's report by Samuel Wilmot stating the owners of Lot 2, Con 1, Thurlow, were "Heirs of Stephen Gilbert (Homan)." Could this be Levi and Sarah? Note also that the oldest child of Levi and Sarah is Gilbert Homan. Frustratingly, this record has not been found to confirm the citation. Stephen Gilbert Jr petitions in 1797 that he has been in the province since 1787 so is likely coming of age about 1797, section 5 of the Stephen Gilbert. Therefore he would be too young to be Sarah's father. This Stephen Gilbert Jr dies between 1813 and 1818 given that his will was made in 1813 and probated in 1818. He names his three sons; Samuel, Abel and James but not his daughters. He leaves Lot 2, Con 1 to his wife, "Sarah Gilbert", until his three sons come of age. Could it be that Levi Homan married the widow Sarah Gilbert? The first child of Levi and Sarah Homan is Gilbert born about 1812. Liz Moult writes, "There were actually 7 children, the 7th was a woman, Elizabeth Sarah (we believe her name was) and was not named in the will. [Note: Stephen is said to have died intestate.] She later petitioned the government for land, wondering why a woman couldn't have a farm. [Note: This petition has not been found.] Stephen Gilbert Sr. tomb stone reads, 'came to Quinte with 7 children.' [This tomb stone has been found.] Sarah Gilbert was born on July 17, 1782, in Ulster County, New York, the child of Stephen. She had 5 children with Levi Homan. She died on July 2, 1867, in Thurlow, Canada, having lived a long life of 84 years." Source: email May 2015 from Liz Moult. Mark Davenport writes, "Like the Walkers, there is close contact between the Homans, their children, and the Gilbert families. Maybe….and I might be going out on a limb here….both Ruth Gilbert Walker and Sarah Gilbert Homan were children of Stephen Gilbert Sr. According to Joseph Walkers petition he came to Thurlow [from the USA] already married with one child. Sarah was only 5 years old (b 1782) when Stephen came to Thurlow. Perhaps Ruth was older, married in NY and stayed there until 1795 or so." Levi and Sarah Homan do not appear anywhere in the contemporary records until the 1851 census. The book Rambling River has two key statements about early records involving John Homan in 1801 and the Wilmot statement about lot 1, con 2. These have not been found. There are also statements that come from later generations of family members. Until the original records are found, it is hard to make a firm conclusion. At this point, this researcher feels it is very possible that Levi Homan married Sarah, the widow of Stephen Gilbert Jr. Information from other researchers is most welcome. Levi Homan's headstone shows that he died Nov. 28, 1865 listing his age as 75 Years, 11 Months and 4 days (birth circa Dec. 24, 1789) and Sarah's stone showing her death on July 2, 1867 at 84 years, 11 months and 16 days (birth circa June 16, 1782). According to the 1861 census both Levi and Sarah were born in Upper Canada and their ages match the birth years on the headstone. Source: Find Grave, Levi Homan and 1861 census. These children are taken from the 1851 and 1861 census data and info from Mark Davenport. Gilbert Homan (b. abt 1812, d. bef 1861) and his wife Sarah (b. abt 1816). Sarah is a widow in 1861. Eliza Homan (b: 15 Jun 1818). Not found yet on census. Liz Moult states that she married Francis Fry. Eliza and Frances had a daughter Mary Anne Fry who married Sam Moult. David Homan (b. abt 1826, d. bef 1861) and his wife Matilda (b. abt 1829). Matilda is a widow in 1861 and living with a Demorest family who may be her parents. Levi Homan (b. abt 1837). Not found yet on census. The surname Homan does not come up in a search of the UCLP index nor the Land Boards. This means it is unlikely that Levi Homan ever petitioned for a free grant. Given that he was born in Upper Canada he could not petition as a settler. Source: Index search at LAC for UCLP's and Land Boards. Source: Schedules of Locations, LAC, RG 1 L4, Land Board Minutes and Records, 1765-1804, Vol 12, dated 1789 (see image 91), C-14028, film on line at heritage canadiana, starts at image 120. Levi Homan was NOT a signee of the petitions in 1798 concerning Meyers mill on the Moira River. Source: See the transcription on this web site. A John Homan is recorded as being the original grantee of Lot 4, Con 5, Thurlow in 1801 in Rambling River. No citation is given. The OLRI does not support this, showing John Conklin as receiving the lot as a free grant c1800. The abstract index of the Thurlow land records shows John McMichael as the recipient of a Crown grant for lot 4, con 5, all 200 acres on 31 Dec 1798. Source: OLRI, AO, fiche, 01 AIV, V 11, p 121. Source: Abstract Index, Thurlow, hastings Co, AO, GSU 197994 and 197995. The OLRI is an index of all the original recipients of a free grant of land in Upper Canada. There is only one Homan name in the index. Mary Homan, of Etobicoke, rec'd a free grant as a DUE on 19 Apr 1820 being the east half of lot 24 & 26, con 3 EHST, Caledon Township. Source: OLRI, AO, fiche, 01 C13, vol 81, p 191. Lot 2, Con 1, Thurlow. Original grantee was Coonrad Frederick in 1803 and in 1817 the owners were "Heirs of Stephen Gilbert (Homan)", about 50 acres improved. The report referred to above was not found in the records below of the surveyor of Samuel Wilmot. These below were examined. These three items are shown in a search of the catalogue on the AO website. "Levi Homan and his wife had come to live on Lot 2, con 1 [Thurlow at Smithville] as the heirs of Stephen Gilbert about 1814. In 1824 he was persuaded to teach at the school in Smithville - which he did until he purchased lot 6, con 5, where the Homans are still living today." He taught school until he moved to lot 6 con 5. Source: Gilbert Homan does not show in the OLRI as the recipient of lot 25, con 4 as a free grant. Family 1: Sarah Homan, b. UC, E Methodist, 42, widow, living as 1 family in a one story frame house. Family 3: Matilda Homan, Laborer, b. UC, widow, Wes. Meth, 32, living with the Demorest family. "Since you have reviewed "The Rambling River", you might know that they had a son named John who married Mary Ann Fredericks. My connection is their daughter Eliza Homan born in July of 1818 who married (a second time) Oliver Mott after her first husband. According to Evelyn Homan (when I corresponded around 1989), Levi was first living in the 1st Concession of Thurlow but moved to the 5th Concession because he may have had family living in the area. He bought the west half of Lot 6 on Concession 5 in 1824." "Steve, you may have solved a problem I have been researching for a number of years. From the book "The Rambling River", it is said that Levi and Sarah Homan came to live on Lot 2, Con 1 as heirs of Stephen Gilbert. I have been trying to find out whether Sarah was the daughter of Stephen Gilbert Jr. or maybe Stephen Gilbert Sr. Stephen Jr. had real estate transactions with the above lot in 1812, and died shortly after. Levi moved there in 1814. Stephen Jr. did not mention his daughter's name in his will, so I penciled in Sarah as a possible daughter, given all the dated transactions. BUT, Stephen Jr. did not come of age until 1797, putting his birth about 1776. With Sarah born about 1782, that would make her the missing 7th child of Stephen Gilbert Sr. and place her birth in Ulster County NY. Stephen Gilbert Sr. came to the Bay of Quinte in 1787 from Ulster County with a wife and 7 children, according to his memorial." Source: Steve Glover - Re: Oliver Mott d. 1887 Steve Glover Posted: 12 Dec 2005 Surnames: Glover, Keene, Mott, Homan, McKenzie Mark - Just saw your question to me. According to a 1970s letter by Kenneth Moult to my Great Aunt Florence (Glover) Love, it was "reported that Levi and Sarah were Hugenots who came to Upper Canada from the U.S. about 1815".